Dark Horse launches BLAST OFF! FROM DARK HORSE: Blast Off!! chronicles the golden era of space toys, an age of imagination unbound by the more mundane realities of space travel ushered in by Sputnik and the Space Age. Containing hundreds of striking color photos of some of the most beautiful and ofttimes bizarre toys ever created -- many never before seen in print -- Blast Off! unearths the nearly lost histories of these space treasures and the companies that created them. 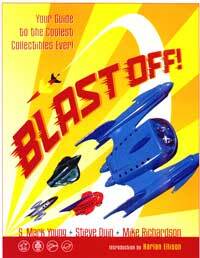 Not limited to the presentation of these unique and fascinating playthings of the past, Blast Off!! includes one-of-a-kind prototypes, original packaging and instructions, glimpses into ultra-rare Japanese robot catalogs, long-lost advertisements, vintage comic-strip and pulp-magazine art, and items of every description from every corner of the globe. Blast Off!! covers extensively some of the most profound toy and space phenomena of the era, from Buck Rogers to Flash Gordon to the "Space Opera" programs of the infancy of television to a blow-by-blow account of the greatest Tin Robot auction in history. Blast Off! Limited Edition Booked Hardcover with Authentic 1950s toy space ship with original instructions and more! http://www.vintage-things.com - Search on Blast Off! I have had the pleasure of talking with both Steve Duin and Mark Young via e-mail and phone. They have, along with Mike Richardson, produced a quality collectible book for space toy fans. I have used my copy of BLAST OFF! as a research source many times and it has lived up to it's title of BLASTING off into the "future past" of our childhood. See the full Solar Guard review for more details . BLAST OFF! was the official companion volume to the Blast Off! Space Toys and the American Imagination October 7, 2001 through January 13, 2002 exhibition at the California Center for the Arts in San Diego. The space toy exhibition was on concurrent view with another large show devoted to great astronomical photography, from the first Moon landing to more recent images from land-based observatories and orbiting craft such as the Hubble Space Telescope and Mars Global Surveyor. Fellow cadet Gene Metcalf was the curator for the exhibition and more information on the exhibit can be found on Gene's Toy Ray Gun Web site. Pictures from the exhibit in California are also available, thanks to Cadet Jeff Bertwits. BLAST OFF! was also featured at the Museum of Science and Industry in Chicago. The museum featured Bob Lesser's world class robot collection. BLAST OFF! was one of several books that accompanied the show. Any Cadets with pictures they would like to share of the exhibit are invited to send them in to the Solar Guard Academy.